Our beautiful mountain home located in North Georgia is just the place for you and your family/friends to have fun and relax! 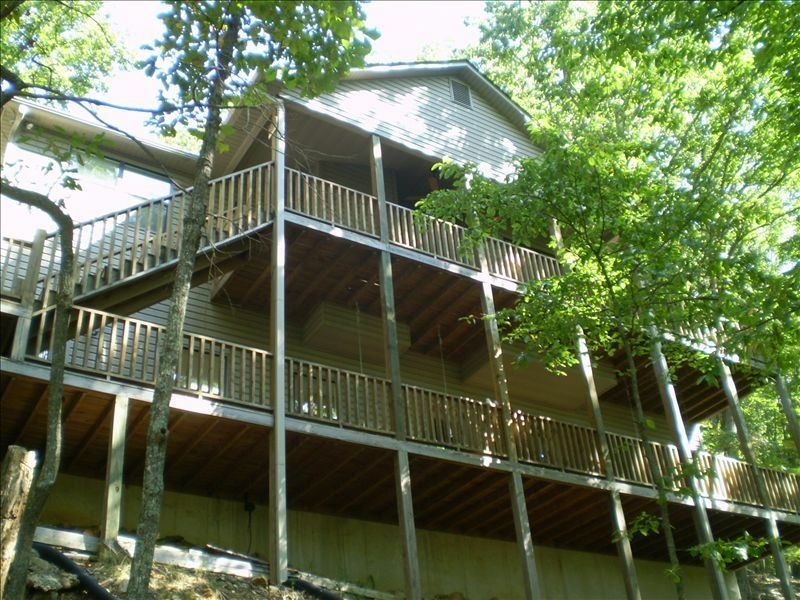 You'll enjoy the peacefulness of the surroundings as you sit in a rocking chair or on a porch swing on one of two large, covered decks that overlook the wooded mountain side. Or perhaps you'll just sit outside at the table to drink a cup of coffee while watching for deer, wild turkeys, or even an occasional black bear. The house is spacious enough to accommodate a large crowd. Whether you use it for a family gathering, a 'Girls Weekend', or to reunite with your old college friends there is plenty of room! There is sleeping space for 12 and, as we've done in the past, you can always throw some sleeping bags on the floor for the little ones! The kitchen table seats 4 and the dining room table seats up to 12 (it's also a great place for games and puzzles!). There is a nice sized family room upstairs and a large playroom downstairs - both with cable TV. The family room, dining room, and kitchen have an open floor plan. If you wish to get out, the Bent Tree Community has many things to offer: 18 hole championship golf, 2 pools (one for adults only and one for families), indoor and outdoor tennis courts, stables and horseback riding, hiking trails with beautiful waterfalls, and an onsite restaurant. The recreation area on the lake has a sandy beach, beach volleyball, a basketball court, a playground, a large grassy field, grills and picnic tables. All of this is within a couple of miles from the house. Our home is located in Jasper, Georgia where there are many area interests. Restaurants and stores are only a 15 minute drive away. The Georgia Marble Festival takes place in Jasper the first full weekend in October. Ellijay, Georgia is a 30 minute drive north and is the host to the Georgia Apple Festival in mid-October. To the east you'll find Dawsonville, Georgia - home of the North Georgia Premium Outlets. There are also many area hiking trails, state parks, and historic sites. We look forward to hearing from you to book your mountain get away! We know that you'll enjoy visiting our home as much as we do! Hi, we're Robert and Anne Manarin. We live about an hour from Bent Tree with our two children and our Carolina Dog. When we began looking for a vacation get-away, we wanted a place where there would be activities within the community to enjoy. At Bent Tree we can spend the day at the beach/lake, we can hike, we can go to the pool, we can go horseback riding, etc. all while staying in the community. If we decide to venture out there are many fun things to do just a short drive away. We bought in Bent Tree 13 years ago because we wanted a place to create memories with our friends and family. One of the most appealing characteristics of our house when we bought it was the fact that we would have room for all of our guests under one roof. Whether we're playing games around the table, sitting on the porch looking over the mountain, or watching football in the family room, we can all stay together. We've had the pleasure of having extended family gatherings, high school and college 'mini' reunions, and even a Girl Scout retreat at our home! Our house is located on the mountainside. We have a seasonal view. Extra large, covered decks. Rocking chairs, porch swings, table/chairs, ceiling fan, picnic table. Daily passes for yourself and guests are $5.00 per person and may be purchased at the pool. This was our second time renting this house. We really enjoy staying here, we love the house and love the area. This is a very lovely home with everything that's needed. My girlfriends and I had a lovely time and would stay here again. The owners were very responsive during the rentall process, but we didn't have to call them once while we were there. That means they did a really great job on the place. We had a wonderful stay at the Manarin home. It was well equipped to cook entire meals. 7 pies from scratch and multiple meals later, we are back home and missing our vacation. We would recommend a stay here to any one! Thoroughly enjoyed cabin. Did have problem with weather. Lights went out 1000 pm Saturday night and were still off at check out time Sunday. Nice house in at the foot of the mountains. The owners were hospitable and everything was seamless on check in and out. Thank you! Please note that VRBO charges an additional processing fee which goes directly to VRBO. This fee varies.